The original Great King St. Artist Blend is an interesting whisky, really nice for a blend. 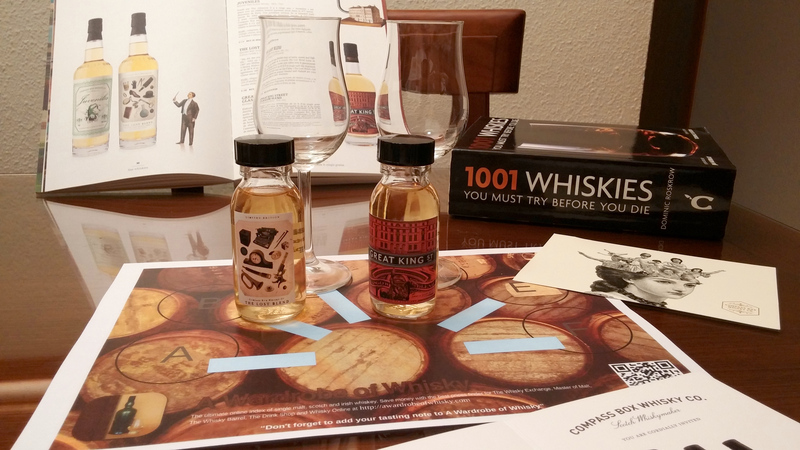 Later I tasted in Whisky Show 2013 two experimental releases: Smokey and Sherried. I usually love peated whiskies but at that time, despite both were quite good, I prefered the sherried one slightly over the original Great King St.
A 50cl bottle of Great King Street Glasgow blend� a peatier version of the Artist's blend. The recipe is 33% Lowland grain and 67% malt (from Islay, the Highlands and Speyside), aged in a combination of first-fill and refill bourbon barrels, first-fill sherry casks, and a small amount being finished in new French oak. A rich and peaty style of blended whisky. Nose (90): more than average. honey, smoke, citrus, spices, vanilla, wood, candies, earth. Delicious! Caol Ila? Palate (90): powerful, oily. honey, peat, wood, citrus, spices, pepper, vanilla, earth, coffee, cocoa beans. Finish (90): longer than average. honey, peat, citrus. So based on other whiskies I have already tasted I rate this Compass Box Great King Street / Glasgow Blend Blended Scotch Whisky with 90 points over 100. A 2014 release, Compass Box's The Lost Blend is a limited edition vatted malt comprised 80% unpeated Highland malts (Clynelish and Allt-a-Bhainne) and 20% peated Islay from Caol Ila. Named in honour of Eleuthera, Compass Box's own lost blend. Nose (89): more than average. honey, flowers, spices, vanilla, cinnamon, candies, apples. Delicate! Palate (91): powerful, oily. honey, peat, vanilla, citrus, spices, fruits, pepper, wood, toffee, flowers. Finish (91): longer than average. honey, peat, spices, vanilla, citrus. So based on other whiskies I have already tasted I rate this Compass Box The Lost Blend Blended Malt Scotch Whisky with 90 points over 100. The Lost Blend is more sutile and complex that the delicious punch peat of Glasgow blend… but Glasgow Blend is just more direct and sincere. A delicious peat punch deliver directly to your palate… It would be hard to choose between them, and the scores show it. I suppose I would buy Great King St. just because I am a peat-head.